A Ukrainian man says he may have the longest eyelashes in the world, thanks to a special food. 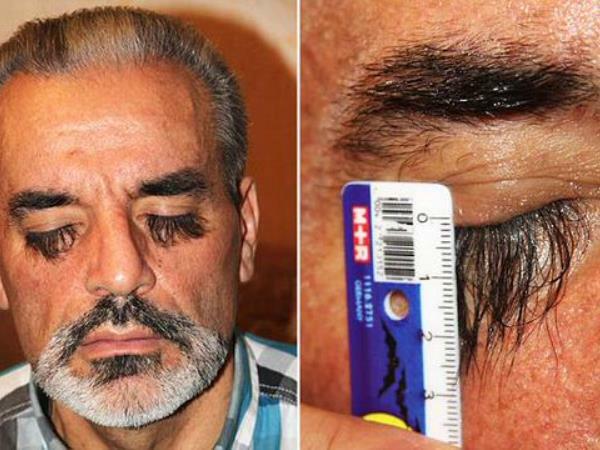 Kiev's Valery Smagliy, (58) will soon have his eyelashes officially measured for a Guinness World Record before cutting them. Valery claims his incredibly long eyelashes are the result of eating a special food. "I started eating something and noticed that my eyelashes really started growing quickly at the same time, and I'm thinking of marketing it so I'm not giving away the secret of what it is." He says he gets a lot of attention, especially from women, because of his lashes. “Women stop me in the street and ask what my secret is because they can see they’re genuine. “But to be honest they are just heavy now and my eyelids are getting sore. And it's also difficult to see properly with huge grey eyelashes in front of my eye." A recent study done by Guillermo Amador of the George W Woodruff School of Mechanical Engineering in Georgia, found the ideal eyelash length for mammals was a third of the length of the eye. Any length shorter or longer can be harmful to the eye, the study says.